Whether on or off the range, safety has to be the number one priority when it comes to air rifles; therefore, everyone should do their part in preventing accidents. In this sport, carelessness and ignorance are the main causes of gun accidents. In this context, carelessness can be defined as the failure to use one's knowledge while handling guns. Ignorance can be viewed as a lack of knowledge of gun operation or safety. Complacency is a tremendously serious concern, particularly among individuals who are frequently around guns because complacency often leads to carelessness. The primary gun safety rule is to always ensure the rifle is pointed in a safe direction. This indicates that the rifle should be pointed so that if it goes off, no injury or damage would be caused. 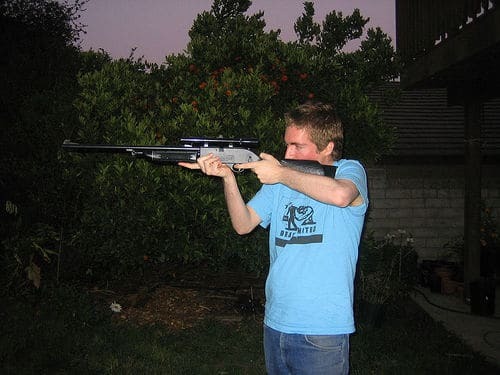 The key to this air rifle safety rule is to always control where the front end of the barrel or muzzle is pointed. Common sense should be used to determine the safest direction, based on specific circumstances. Whenever you pick up a rifle, the mechanical safety should be immediately engaged, if possible. If there is a magazine in the gun, it should be removed before the action is opened and before looking into the chamber, which should be free of any projectile. If you are not aware of how to open the action or examine the chamber, the rifle should be left alone and you should seek assistance from someone who does. When holding a rifle, rest your finger outside the trigger guard and along its side. In essence, you should not touch the trigger until you are truly ready to fire. The targets that can be used are specified by the range SOPs or Standing Operating Procedures. They also specify the distances at which targets may be placed, the kinds of shooting activities allowed and the types and calibers of rifles that can be used. SOPs violations could create a dangerous situation. Therefore, every time they shoot, individuals should check their targets and know what is beyond them. It is vital for shooters to ensure their rifles are safe to operate; this is typically carried out during routine cleaning and maintenance. Additionally, shooters should be aware of any change in recoil, sound and operation that takes place during firing. The manual of a particular rifle is its best information source. Another remarkable source of gun information is the public library. It is crucial for shooters to know how the major parts of their rifles operate, how to clean it and how to load it and unload it. In addition, the RO or Range Officer should be aware of how a rifle operates before providing support. If an RO comes across a rifle with which he or she is unfamiliar, assistance should be sought from another knowledgeable RO or the owner's manual should be read. An excellent method of expanding knowledge, when a range is not being supervised, is to ask shooters of unique rifles to show how their firearms are properly operated. Only projectiles that match the guns should be used by shooters. To make sure the proper projectiles are used, you should check the size and type of the projectile stamped on the rifle or consult the owner's manual. Guns can emit gas and debris that could cause injuries to the eyes. As such, spectators and shooters alike should put on shooting glasses and hearing protectors. In fact, it should be specified by the range SOPs that eye and ear protection should be worn by all, including spectators to prevent injuries. Essentially, when shooting, the wearing of shatterproof eyeglasses or safety glasses is highly recommended. It could also be a requirement of the local range. All members of staff should wear safety glasses as well. Sound travels outside the immediate firing range and rifles make sounds that could cause damage to the hearing. Therefore, it is important to wear hearing protectors. Even though firearms have a significantly higher amount of pulse and noise pressure than air rifles, it is still important to wear hearing protectors at all times; whether on the firing line or on the range to make sure no hearing damage takes place. Additionally, hearing protection heightens concentration on the line by lessening distractions during shooting. Mind-altering substances like drugs and alcohol should be avoided before and during shooting as they will likely impair normal physical and mental functions. Included among the forbidden substances are non-prescription and prescription drugs like cold medicines, which could result in side effects such as balance problems, nervousness or drowsiness. Individuals taking any substances that could impair normal physical or mental capacities should not be permitted to use the range. Safely and securely storing rifles requires that access is denied to untrained individuals, particularly children. There is a variety of security storage devices like safes and cases available to store rifles securely. The owner of the rifle is ultimately responsible for ensuring the safekeeping of his or her weapons. Following these important safety measures for air rifle are extremely essential. They will allow shooters to safely enjoy the challenges and excitement associated with the craft of marksmanship.